Raw papaya is an interesting vegetable. While it becomes a table fruit once ripe, the raw fruit makes wonderful salad, raita, paratha, chutney and even curry. The neutral taste of raw papaya makes it a perfect candidate for any flavour you want it to acquire. This kachhe papeete ka ishtoo is actually a stew that everyone loves with all types of Indian breads. I remember we used to love it with do pad ki roti, poori or crisp parathas. Kachhe papeete ka ishtoo is spicy, aromatic and yet very light so it can be a part of light meal with thin chapatis and makes a paratha meal comparatively light too. Heat the oil in a deep pan keeping the heat low, a handi or pressure cooker that can be used with or without the pressure lid. Add the whole spices, dry red chilies and smashed garlic at once and wait till they all become aromatic. It takes less than a minute. Add the sliced onions and potatoes, mix well and cook till both look a little glazed. It takes just 2-3 minutes. You don't need to brown the onions but a few brownish streaks are okay. Add the papaya chunks, toss to mix well. Add salt and mix. Cover with a well fitting lid and let it cook on dum till everything gets cooked well. The papaya chunks will start disintegrating and the onions will almost dissolve. You can add a few spoons of water in between to keep the dish moist at all times. This dum cooking can take about 30 minutes but if you pressure cook it gets faster. Take care to switch off the gas just after the first whistle blows. The onions and raw papaya has enough water in it to make this stew watery enough but you can add up to 1/4 cup water to make the cooking easier. 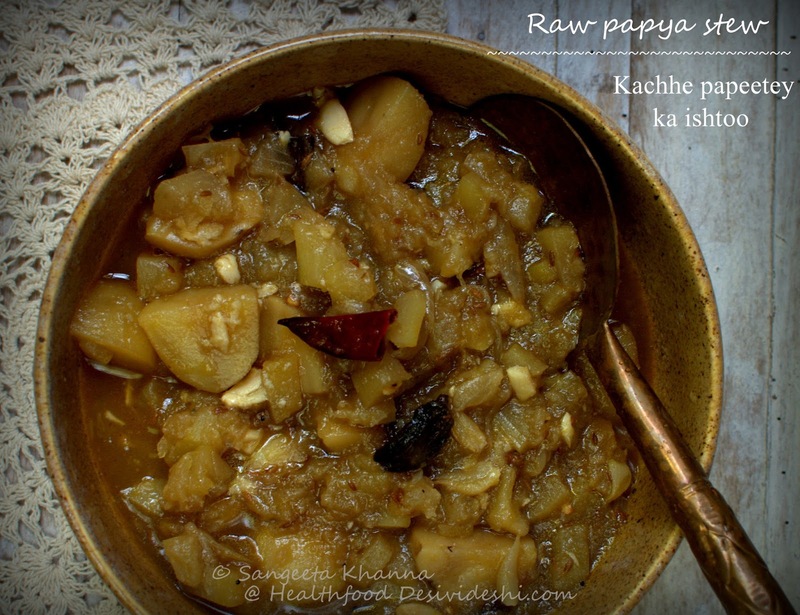 This kachhe papeete ka ishtoo is quite aromatic and delicious and can be made with bottle gourds too. Some people like it just with potatoes but use more onions in that case if you try. The kathal ka dopyaza is a similar recipe with minor differences but the taste of kathal ka dopyaza is very different from this one. Some people call it kachhe papeete ka dopyaza as well. Do try this recipe and serve with any regular chapati or roti you eat. This stew pairs well with light flat breads and not too much with millet breads but we like it with our mixed grain rotis too. 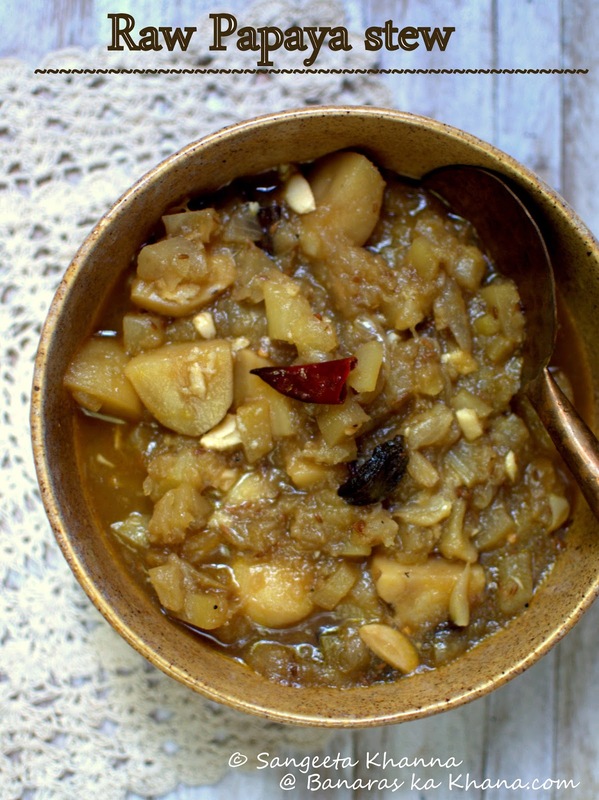 I have shared a basic recipe of this kachhe papeete ka stew with dal bhari poori here. It is actually a versatile subzi and can be served with whatever you like.